While other manufacturers tend to put higher pixel count sensors in their new cameras, Pentax has made an unusual move and put a larger sensor in the latest addition to its Q series of compact system cameras (CSCs). Whereas the Pentax Q10 has a 12-million-pixel, 1/2.3-inch CMOS sensor, the new Pentax Q7 has a 12-million-pixel, 1/1.7-inch CMOS sensor. A 1/2.3-inch sensor typically measures 7.66 × 6.17mm, but a 1/1.7-inch sensor is usually around 9.5 × 7.6mm. Increasing the size of the sensor while keeping the pixel count the same should ensure improved image quality, at least at the centre of the frame, because larger photo sites gather more light, generate less noise and have a greater dynamic range. However, the Pentax Q7 has exactly the same mount as the Pentax Q10 and accepts the same lenses, so it is possible that the corners and edges of images captured by the Pentax Q7 are softer and have more chromatic aberration and darkening. According to Pentax UK's Stephen Sanderson, the original Pentax Q design and its compatible lenses were built with this change in mind, so image quality should be improved across the frame. We will only know for sure once we have tested a full production sample. Another consequence of having a larger sensor is that when lenses are mounted on the Pentax Q7 the angle of view is slightly wider than when they are mounted on the Pentax Q10. The Pentax Q10 has a focal length magnification factor of 5.5x, while the Pentax Q7 magnifies the focal length by 4.6x. The widest lens currently available for the Q series is the 3.2mm f/5.6 fisheye lens. On the Pentax Q10 this produces images comparable with a 17.5mm lens on a 35mm camera, and on the Pentax Q7 it's 16.5mm. Meanwhile, the 5-15mm standard zoom lens, which on the Pentax Q10 is equivalent to a 27.5-83mm lens, becomes the equivalent of a 23-69mm optic on the Pentax Q7. In addition to changing the size of the sensor in the Q7, Pentax has changed the filter over it and, following the current vogue, there is no anti-aliasing filter. This should enable the camera to produce sharper images, with more detail - albeit with the increased risk of moiré patterning. There's still a dust reduction mechanism that makes the infrared filter vibrate to reduce the need to clone out dust marks from images captured by the Pentax Q7. Like the Pentax Q10, the Pentax Q7 is designed for use by novices as well as enthusiast photographers, and consequently it has the usual program, shutter priority, aperture priority and manual exposure modes, in addition to an automatic option and 21 scene modes. The combination of the new sensor and the Q Engine has enabled Pentax to give the Q7 a maximum sensitivity setting of ISO 12,800. The start-up time has also been improved, and it now takes approximately one second to boot up. Pentax also claims to have improved the focusing accuracy in low light situations. As before with the Pentax Q10, the Pentax Q7 as a Shake Reduction (SR) system, but this has now been upgraded to enable you to shoot handheld images at up to three stops slower shutter speed than normal. The Pentax Q7 is capable of recording raw and JPEG files, and there are 11 Custom Image options - namely Bright, Natural, Portrait, Landscape, Vibrant, Radiant, Muted, Bleach Bypass, Reversal Film, Monochrome and Cross Processing - to give JPEG files a particular look. There's also a number of digital filter effects, including Toy Camera, High Contrast, Shading, Slim, HDR, Invert Colour, Extract Colour, Watercolour, Posterization and Fisheye. Having a slightly larger sensor than the Pentax Q10 should mean that it is easier to control depth of field with the Pentax Q7, but it still has the Bokeh control first introduced with the original Q. When this mode is selected the camera applies additional blur to out of focus areas to simulate the effect of having a wide aperture and a large sensor. 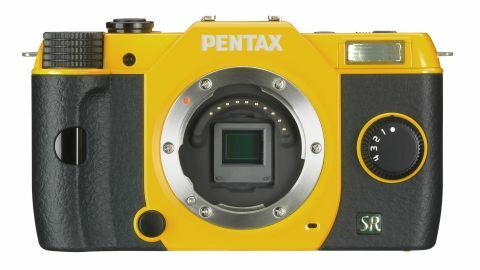 Other headline features of the Pentax Q7 include a maximum continuous shooting speed of 5fps, Eye-Fi SD card compatibility, a three-image HDR mode, a multiple-exposure mode, remote control receptors on the front and back panels and a digital level that indicates when the horizon is correctly aligned. The Pentax Q7 is small and neat, and feels nicely made - although as before, there's no sealing against dust or moisture. It is constructed from engineering plastic, but still feels pretty durable, and the narrow finger-grip provides good purchase. The pop-up flash, however, still seems a little flimsy. There's no getting away from the fact that those with large hands will find the Pentax Q7 a little on the fiddly side, but the controls are sensibly arranged on the whole, and the dials enable you to make quick adjustments. A dial on the top of the camera gives you access to the exposure modes, Bokeh control and video mode, enabling you to make rapid changes. Those who want to shoot snippets of video here and there, however, may find it frustrating that recording can't just be started from any exposure mode with a press of a button. A dial on the front of the camera provides access to one of five functions, including the focus method, Focus Peaking and the ND filter. You can set the different functions that the dial controls via the main menu. Within easy reach of the thumb is a scrolling dial which controls different functions, depending on what exposure mode you're in at the time. So, for instance, when shooting in aperture priority, you use it to alter aperture. When in fully manual mode, you can switch between aperture and shutter speed by pressing the exposure compensation button. There's also a traditional four-way navigational pad on the back of the camera. From here you can directly access some of the key settings you'll probably want to change frequently, such as sensitivity (ISO) and white balance. Changing the autofocus point is a relatively easy process, despite the fact that the Q7 doesn't have a touchscreen. All you need to do is press the OK button in the centre of the navigational pad, and then use the directional keys to move aorund to the point you require. A touchscreen would have made this process quicker, but with only 49 points clustered around the centre of the frame, it's not too slow a process. To access other settings that you might want to change fairly often, you can press an info button on the rear of the camera which brings up a sort of quick menu which contains settings such as metering, file format and aspect ratio. The settings contained within this menu can't be changed though, which is a shame if you find yourself not using any of them. A final button which deserves a mention is the green button just above the navigational pad. This is a quick way to reset certain settings – for instance if you are altering exposure compensation, a quick tap of the green button will reset it +/- O, saving you have to scroll though the whole range. One particularly useful feature of the Q7 is that it will show you how an image is going to look when you make changes to certain settings, by displaying whichever photo you took last as if it had used that setting. It's a handy way to quickly tell if the setting you're choosing is correct, perhaps even more so when switching between different colour spaces or digital filters. When focus peaking is activated and you're using manual focus, then white highlights will be shown on screen to indicate when focus has been reached. It's a helpful feature and makes it easier to focus correctly, but it would have been nice if different colours could have been selected as it's not always easy to see white highlights if you're photographing something pale or quite bright. Despite the camera's small size, it still has a full sized SD card slot, unlike the micro SD slots of other small compact system cameras such as the Samsung NX Mini or the Nikon J4. This is good news if you already have a slew of SD cards in your arsenal. Like the Pentax K-50 introduced at the same time, the Pentax Q7 is available by special order in one of 20 different body colours, with a further choice of different grip colours. So if you want a pink and blue, orange and lime, green and lilac or blue and brown camera, you're in luck. The standard colours in the UK, however, are black, silver and yellow, with matching kit lenses. The standard prime lens is also available in the same 20 colours as the Pentax Q7 body. The price of the Pentax Q7 and the new Q lens is yet to be confirmed.